Flights to Walvis Bay are cheap from South Africa. Walvis Bay is a small town in Namibia named after the bay located inside the Town. Walvis Bay translates as Whale Bay and it was the name given to the bay because it was known to have attracted many Southern Right Whales, which later attracted many mariners. Walvis Bay harbour is also the only natural deep-water harbour and a protected area, home to plankton and other marine life. Due to its colonial heritage, Walvis Bay has both British and German influences. 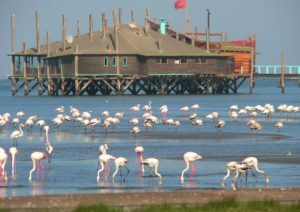 There are plenty of things to do after you’ve landed from one of the many Flights to Walvis Bay, these include the likes of exquisite and cosy holiday accommodation to sightseeing at its best; Walvis Bay has something for you to share when you return home. Dune Drives are this region’s best whether you’re into 4×4 drives or taking on this challenge with a beach buggy and whilst exploring dunes you should make sure that you discover Dune 7, Namibia’s tallest dune standing at 383m tall. When it comes to great eateries, cruises and more leisure in the area, you’re in for a treat. Stop-overs, connections and the airline as well as the aircraft and weather can all contribute to how long a flight from one place to another may be. Query your flights to Walvis Bay times with your airline of choice.